The first is Adnan’s Hotmail account. Adnan says that he went to the Woodlawn Public Library after school on Jan. 13 to check his email. That’s when Asia says they had a conversation about his breakup with Hae. So if we could only get our mitts on his Hotmail account or the metadata to his Hotmail account, then maybe we could look to see if he was, in fact, checking his email between 2:15 p.m. and, say, 2:36 p.m. when the state said he was committing a murder. We have his old username and password, so first we tried those. No dice. Then we asked Microsoft. A very nice lady who manages their public relations told us that the official party line is that his account is no longer available. We asked her to clarify: Is it not available because nobody wants to go get it off some antiquated piece of technology deep in the bowels of Microsoft or is it not available because the account and all its related 1’s and 0’s have been erased from the universe? She did a lot of digging - this is not a question Microsoft gets asked every day, apparently - and returned with an answer: Adnan’s Hotmail account no longer exists anywhere in the universe. So, onward. The next thing that mysteriously vanished into the ether was Hae’s computer. Hae wrote in her diary that she had copied parts of the diary into her computer. And at some point in 1999, when this was still a missing person’s case, the Baltimore County Police Department took Hae’s computer to see if it could provide any clues. Det. John Rau of the Computer Crimes Unit subpoenaed Hae’s AOL account records. The note is signed by Baltimore City detectives MacGillivary and Carew on February 19, 10 days after Hae’s body was found and the case was transferred to the City. Another note from that same day says that the Baltimore City cops had asked the Baltimore County cops to help out with the case. And the Baltimore County cops said no problem, they’d get a search and seizure warrant for the computer. And that’s the last we hear of it. There are no more reports on the topic and nothing in the case file relating to the results of the search and seizure warrant. The detectives didn't tape every interview they conducted, but they did take notes. Most of these notes came with an information sheet on the interviewee - standard stuff like street address, social security number, (and whether or not the person was drunk at the time of the interview). Usually, both the notes and the info sheet were included in the case file. So we've seen notes on the detectives' interviews with various teachers, friends and key players, like Jenn and Jay. Though, as we've mentioned, there are no notes for the three, untaped hours before Jay's second interview. There are also no notes on a few other people, whose stories we really, really wish we had. The first is Mark, Jenn's younger brother. Jay said that he hung out with Mark on the afternoon of Jan. 13, after dropping Adnan back off at school. At the second trial, Jay said he and Mark played video games and then went to the mall, all before Jenn got home from work. Jenn, of course, has always said she got home from work before Jay arrived at her house that day. We have no idea if the detectives ever interviewed Mark, because there's no information sheet on him. The second person we wish we'd heard from is Patrick, the guy Jay calls from Adnan's cell phone at 3:59 p.m. on Jan. 13. Jay's story is that he called Patrick to get some weed after he and Adnan had ditched Hae's car at the Park and Ride. As we've discussed in the podcast, Jay's story about calling Patrick doesn't add up. The cell phone wasn't where Jay said he was when he made the call and, according to Jay's story, he had only left Jenn's house 14 minutes earlier. He still had to make stops at Jeff's house, Best Buy and the Park and Ride. The case file has an information sheet on Patrick's sister, which means they probably questioned her. But there are no notes on that interview and no information sheet or notes on any interview with Patrick. Same goes for mystery witness #3: Phil. At trial, Jay identifies the phone number called at 3:48 p.m. as belonging to his friend Phil, but he says he can't remember why he called him. Phil lived in Frederick County, about an hour's drive from Woodlawn. But again, like Mark and Patrick, we've never seen an information sheet or any interview notes on Phil. 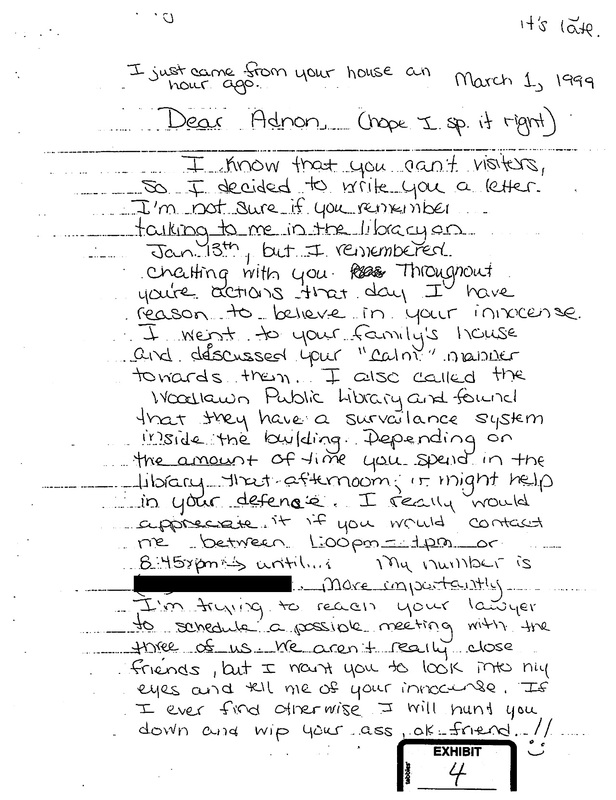 We have Adnan’s cell phone records memorized by now, but they only tell part of a murky story. For example, we can’t see who was calling his phone - those calls just say “incoming.” So we can only see what numbers were dialed from his phone. The detectives subpoenaed a whole bunch of other cell phones and pagers and landlines, though. At least 15 other numbers. We have the subpoenas, and for some of these, we have some basic subscriber information – like who was assigned the number and what their address was. But we don’t have a detailed call record like we have for Adnan’s phone for anyone except Yaser and Bilal, Adnan’s youth mentor from the mosque. It could very well be that the detectives never had this information either, that all they wanted or needed was to know which number belonged to whom. But we can’t help but think that some other detailed call records could have offered some valuable clues.